They've conquered the world, and now they've come home. Photos of the winning U.S. women's soccer team celebrating in Los Angeles will get you re-pumped by the fact that "We Are The Champions!" Permission to unleash your inner Queen? I'll allow it. 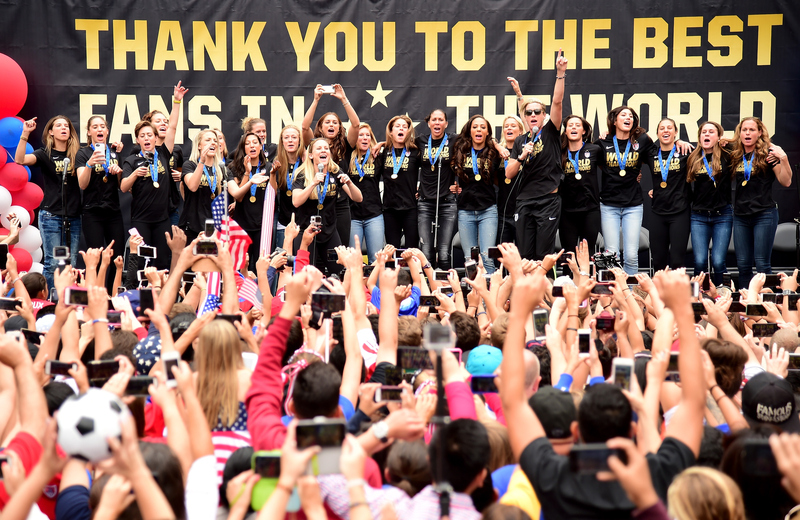 The U.S. women's soccer team on Tuesday was greeted by thousands of screaming fans at L.A. Live in downtown Los Angeles. Chants of "U-S-A, U-S-A," echoed throughout the city center as the players took to the stage. Goalie Hope Solo championed the fans as much as they cheered her on. You stayed behind us, you believed from day one, from game one, all the way through game 7. I'm honored to be American, I'm honored to be on this team, and I'm honored to play for you guys and for this country. The U.S. team's 5-2 win over Japan on Sunday garnered the country's third World Cup championship ever and first since 1999. FIFA later announced the match was the most-watched soccer game of all time in the United States for both the men's and women's tournament. In fact, a solid 25.4 million Americans tuned in to watch the World Cup final, more than averages of the NBA finals or the NHL's Stanley Cup.